I apologize for making you wait. How could I spend all these months eating and cooking in Bali without sharing this island's signature dish? Before we left home last August, everyone I know who has been to Bali pleaded with me to share a black rice pudding recipe. There is something magical about this dish. Even eleven years after our first visit to Bali, I distinctly remembered the creamy, sweet satisfaction. Black rice pudding is served for breakfast, afternoon tea, as well as for dessert. I have yet to find a Balinese menu without it. I have heard that black rice is a highly nutritious grain. 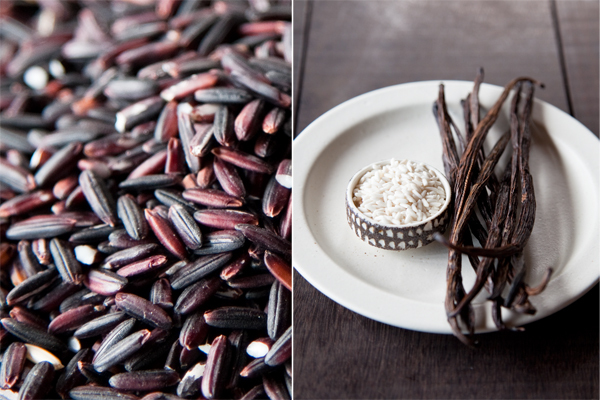 In my sleuthing, I read that black rice considered a super food, is loaded with iron, and is a powerful antioxidant. Black rice has been called "forbidden rice" in China where only the emperor was allowed to eat it. I must say, this grain does seem august and I'm quite happy it isn't forbidden. I have tried a number of recipes for this dish. After much experimentation, I came up with this version that I hope you love as much as we do. Soak black rice overnight in 4 cups water. Add sticky rice and soak another hour or two. Add pinch of sea salt and simmer rice until cooked - approximately 45 minutes. Rice should be soft to the bite, moist, and glistening. Pour out any excess cooking water. Scrape the inside of a vanilla pod and add the essence to the cooked rice. Stir. Add sugar. ( You can add more or less than I suggested, depending on how sweet you like your pudding.) Stir again to coat. 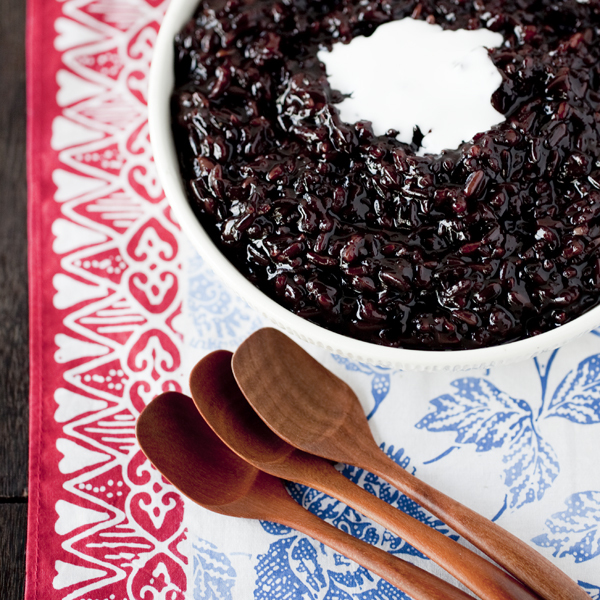 Now your silky black rice is ready to eat. Top with coconut cream or coconut milk. You can also add shredded coconut and even vanilla ice cream to be totally decadent. I love rice puddings. And black rice is so nutty tasting, I bet it makes one fabulous dessert. Thank you, thank you, thank you!!! I have some black rice and some sticky rice and was waiting for the world to offer up a recipe for pudding!!! How fun!! I so remember learning to make this with Nitti, the mom of the family I stayed with in Ubud. If I had thought about it I would have asked too. So glad others were thinking for me. My most recent attempt was not great (my own spontaneous try) - so I'm looking forward to this! Love! Yum! 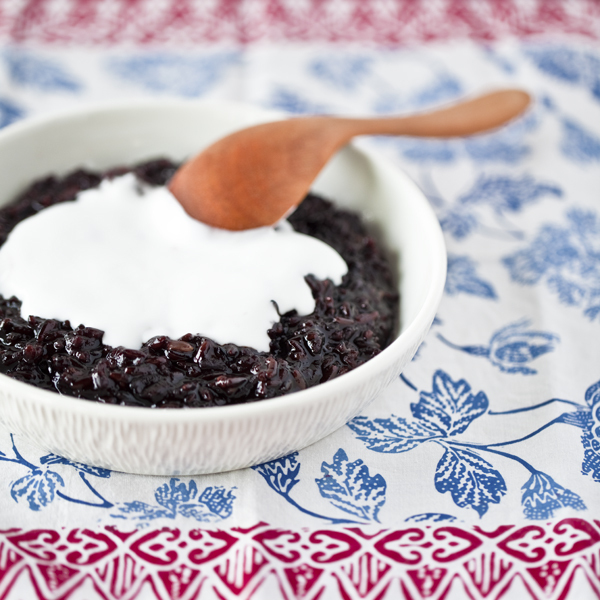 I love rice pudding but I've never made or tried a black rice version. Soaking the rice ahead of time sounds like it will lead to a yummy soft pudding. Can't wait to try it! I'm not a huge fan of rice pudding, but this definitely looks worth trying. More stunning photos too. LOVE this dish! Love the use of vanilla, would make this truly heavenly (originally I always used pandan leaves and coconut milk). So simple yet so delicious! Nice to know it's also healthy. Vegan rice pudding! I just made it and absolutely loved it. Thanks for sharing. Thanks everyone for all the sweet comments!!! This has got to be fabulous rice pudding! Not sure I have ever had black rice but I know I would love it. I just discovered your blog, and am entranced with your food adventures. What an opportunity you and your family have had to explore such cultures and food so far from home. I hope you don't mind me saying that I hope you, your husband and your children can appreciate all these opportunities. It would be a shame if you all take it for granted. So many of us struggle to put food on the table, and sometimes are able to indulge in something special. I (obviously) have a computer, and a sense for good eats....but will never be able to shop in Bali or New Zealand or Australia, but do appreciate that you are sharing this all with the rest of us. Gratitude is a gift that I wish for you and your family. I'm grateful for what you have shared. Thank you for the thoughtful comment. At least once a day since we've been traveling, and even before this amazing trip began, we say how lucky we are to be able to have such an experience. Not only do we feel grateful for all the adventure - seeing beauty, meeting new people, and tasting exotic foods - we are thankful for the time we are getting together. We know how rare our opportunity is and cherish the family time beyond words. I found black rice at our local oriental grocer...I am looking forward to making this dessert. Thank you! I recently returned from Bali and one of the most delicious treats I discovered was this dish and that's saying something, seeing as I rarely eat puddings owing to the fact that I do not have a sweet tooth. In fact its the first 'bali' recipe that I have put up on my blog. Really glad to have stumbled across yours - its really stunning. I'll definitely be stopping by again. Thanks for the nice comment. I do miss Bali and the ubiquity of black rice pudding! can i substitute stevia for the sugar? i'm trying to reduce my insulin levels. Hi Deanna, I think it's worth trying stevia, though the flavor will be different. Have you looked into coconut sugar? Its quite interesting, and the taste is delish! Halloween PotLuck at work tomorrow... Looks like I'm taking your Black Rice Pudding! So cute. I like the idea of black rice pudding for Halloween!